Are you looking for an all-natural sweetener to add to your favorite foods and hot beverages? Do you wish you could find something sweeter and healthier than refined white sugar? 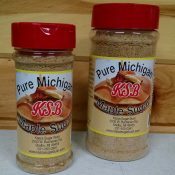 If so, Pure Maple Sugar from Kasza Sugar Bush is the perfect option for you. Our granulated sugar is made from one thing and one thing only—pure maple syrup. We take the syrup and cook it down until there is no water left, as it then becomes only sugar and trace minerals. The end product is exactly the thing that most our customers seek—a natural sweetener that is healthier for the body than refined white sugar. Since our Maple Sugar is sweeter than white sugar, we recommend only using half the amount you typically would. As such, Pure Maple Sugar is the ideal option to sprinkle atop your muffins, toast, oatmeal, cold cereals, cookies or other foods you enjoy. In addition, it will add a tasty punch to your coffee, hot chocolate, tea or other beverage that gets you going in the morning. Please note, we offer our Pure Maple Sugar in 5 ounce or 10 ounce sugar shakers, and we sell it to you in bulk, depending on your specific needs. If you have any questions, stop in our store in Shelby, Michigan, or give us a call today.